Opiate addiction in the United States has reached critical mass and is now one of the nation’s leading public health crises. Overdoses have escalated to record highs every year for the past four years and, according to the Centers for Disease Control and Prevention (CDC), killed 42,249 Americans in 2016. Between legally regulated prescription opioid painkillers such as oxycodone, hydrocodone, and morphine, and illicit opiates such as heroin, opioids pose a greater-than-ever risk to every portion of the United States population. The Substance Abuse and Mental Health Services Administration (SAMHSA) reports 11.5 million Americans misused prescription painkillers in 2016, and nearly a million used heroin. Each person who struggles with this disease has a group of loved ones suffering right alongside them; however, this group is also empowered to guide their loved one toward treatment and lasting wellness. Addressing collective opiate addiction starts with identifying and confronting it in our homes and communities—and that begins with identifying the disease in family and friends. While each opioid use disorder (OUD) sufferer’s case is different based on their individual histories, there are a variety of physical and behavioral signs that are common to all types of people. Deceptive and curious behavior. One of the primary behavioral indicators that someone is suffering from opiate addiction (or any type of chemical dependency) is their duplicity about their behavior. This can include their whereabouts, prolonged periods of absence, abrupt changes in their routine, increases isolation, and more. Defensiveness regarding use of opioids. This is particularly true for someone addicted to prescription painkillers who has been taking medication for a legitimate pain issue. Addiction to these pills can form quickly, and the person will often act aggressive if they feel as though their intake is being restricted. Neglecting responsibilities. Putting drug use above everything else means that those addicted to opiates almost immediately suffer a decline in professional and academic performance and neglect their family responsibilities. This can also lead to financial issues such as loss of savings from drug purchases, and legal issues such as incarceration. Drug seeking and other risky behaviors. The more desperate the person gets the more apparent the lengths to which they will go to feed their addiction will become. This can include doctor shopping for prescription painkillers, theft, and other illegal activity to procure drug money. Driving under the influence of opiates is another classic indicator of addiction. Biological tolerance. As opiate abuse continues, the brain and central nervous system require more frequent and potent doses to sustain the similar effects of euphoria and relief. In the case of drugs like heroin and fentanyl, tolerance can develop particularly quickly and render patients addicted after a very short time. Intense cravings. Opiates create serious and profound changes in the brain’s chemistry. When neurobiological tolerance develops and addiction forms, it can cause sufferers to go to extreme and sometimes unthinkable lengths to procure opioids. It’s as if the person’s brain has been hijacked by the drugs. Withdrawal symptoms. Withdrawal is one of the primary early indicators of dependency and can include a variety of physical and psychological symptoms that can range from mild to severe—such as headache, flu-like symptoms, fatigue, sleep disorder, joint and muscle pain, depression, anxiety, hallucinations, suicidal ideations, and even seizures and coma. Changes in social circle. It’s very common for those suffering from opiate addiction to stray from their established circle of friends and coalesce with others who suffer the same addiction. These drugs have a toxic and dangerous way of bringing people together out of a desire to use. This connection is fueled by the promise of quick access and other related factors. Changes in physical appearance. These changes can include sudden and extreme changes in weight, sunken eyes, tooth decay and other dental issues, track marks on the skin, and more. Persistent coughing and labored breathing are also common physical indicators and should be addressed immediately. Constant preoccupation with opiate use. This can manifest in a number of ways, including something as subtle as watching the clock between doses of prescription painkillers, to something more extreme like scheduling activities and entire days around opiate use. 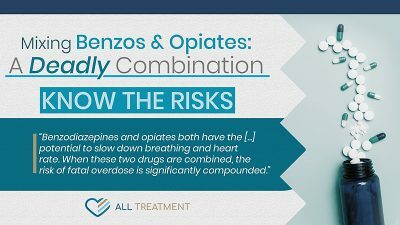 Loved ones of those suffering from opiate addiction are uniquely positioned and especially empowered to identify a problem and help guide their addicted friend or family member toward treatment. These people seldom recognize their own dysfunction or endeavor to seek treatment on their own. Don’t ignore the signs. Identifying these signs can be critical in saving their lives. 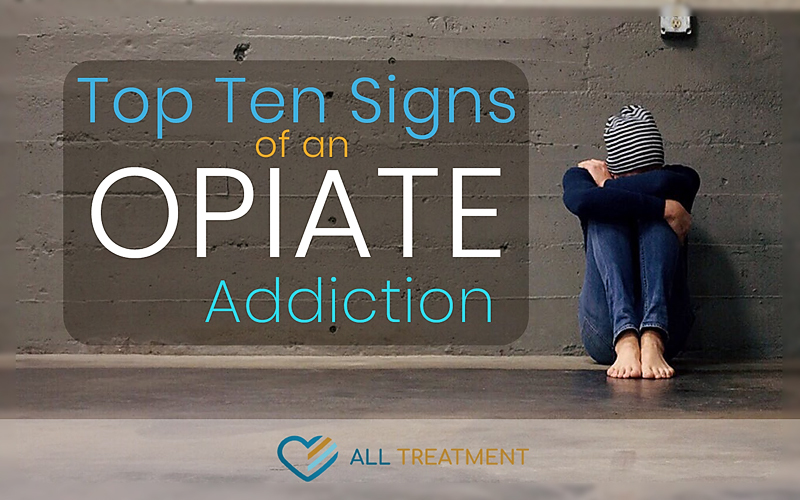 If your loved one is experiencing any of the top-ten signs of opiate addiction, something as simple as conversation can let them know that they have a problem, but also that they have a committed and supportive ally on their road to treatment and recovery.